Adams County Nursery – For home gardeners or commercial fruit growers. Find a wide variety of fruit trees, orchard supplies and orchard related literature. You'll also find helpful guides for fruit tree planting and fertilizing as well as useful links and articles written by some of the most recognized fruit tree experts. Berkshireberries.com – Jams & Jellies from Nourse Farms fruit. Made in small batches using Mary Graves' own recipes. Verti-Gro – Stacking pots in vertical towers allows for very high density production in smaller spaces. Vertigrow is a source for vertical hydroponic growing supplies. Ag Answers – Ag Answers provides agricultural problem-solving advice, strategies, and reminders to help Indiana and Ohio farmers better manage their crops, livestock and marketplace transactions. American Farm Bureau Federation – Farm Bureau is the voice of agricultural producers at all levels. Farm Bureau is an independent, non-governmental, voluntary organization governed by and representing farm and ranch families - united for the purpose of improving, economic opportunity and social advancement. National Berry Crops Initiative – The National Berry Crops Initiative is a partnership of industry, academia and government formed to develop a strategic plan for continued growth and sustainability of berry crop production in the United States. North American Blueberry Council – All about blueberries. 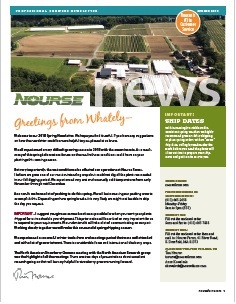 If you are a farmer, work in food service, are a teacher, or food processor, you will find useful information here. North American Farmers’ Direct Marketing Association – For those involved in marketing farm-grown produce to consumers directly via farm stands, farmers markets, pick-your-own, etc., or if you are considering doing so. North American Strawberry Growers Association – Find support and lots of information here. An association dedicated to strengthening and improving strawberry production and marketing. Members include growers, researchers, extension specialists, etc., from 40 states, 10 Canadian provinces and 15 countries. United Fresh Fruit & Vegetable Association – United Fresh Produce Association is the industry's leading trade association committed to driving the growth and success of produce companies throughout the global, fresh produce supply chain. International Fresh-cut Produce Association – Many articles on food/produce, nutrition and diet. USDA Market News – Agricultural Marketing Service helps buyers and sellers market their perishable products in the most efficient manner. Find prices of products in U.S. and world markets connect with companies that supply foodservice products, more.